We had another amazing Creative Sparks session last night. Lots of great photos and insights from the group. I always enjoy our Thursday evenings and want to thank everyone who was been there over the past few months for participating and bringing such great work. This week’s featured image is from Laurie Young. Laurie went to Boston as part of her summer vacation and brought back lots of interesting photographs including this one taken of the Irish Famine Memorial. I really like the strong diagonal lines of the buildings leading down to the figure in the sculpture. 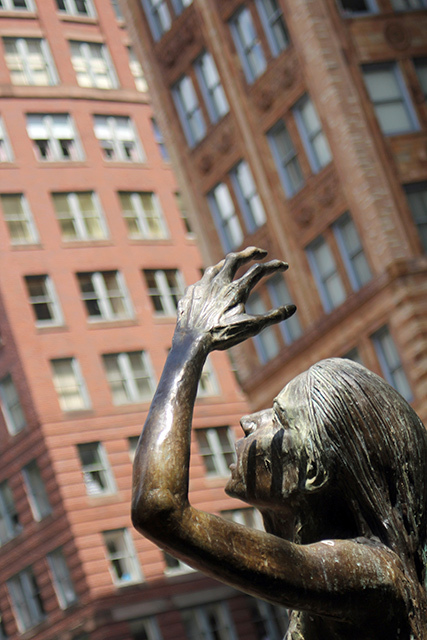 Even without the context of the entire memorial we clearly see the emaciation in the woman’s hand as she raises it to block the sun from her eyes. The light is in perfect place making the sculpture feel alive. Photograph © Laurie Young. All rights reserved. Used by permission.